This festive little winter dish is inspired by this one I made about a year ago. 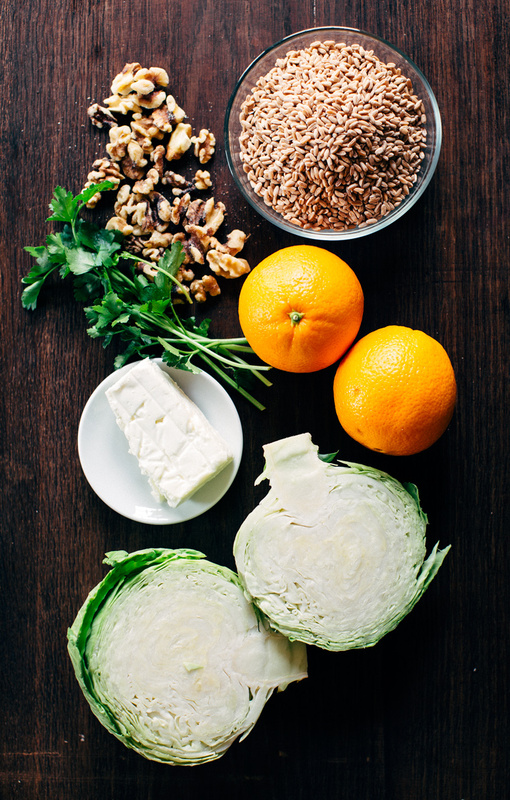 Cabbage is definitely one of those veggies that doesn’t get nearly enough credit or attention. 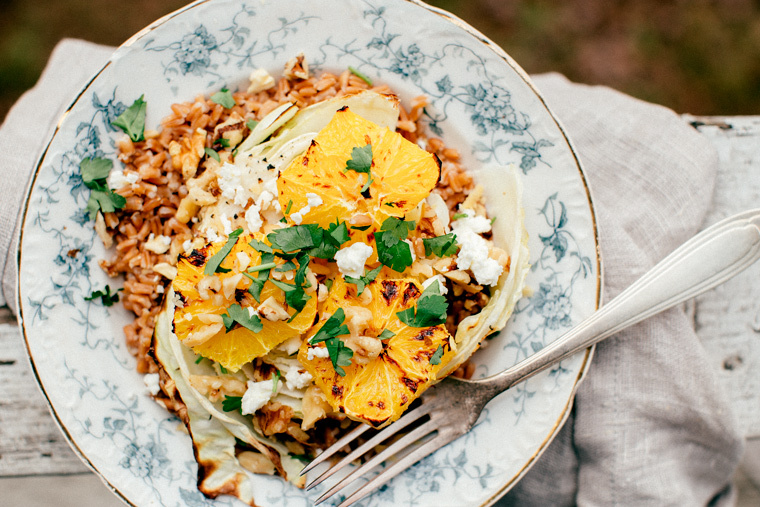 Roasting it like I did here brings out its natural sweetness – the broiled oranges on top makes the whole dish burst with fresh flavors and little bits of salty feta are the perfect contrast. 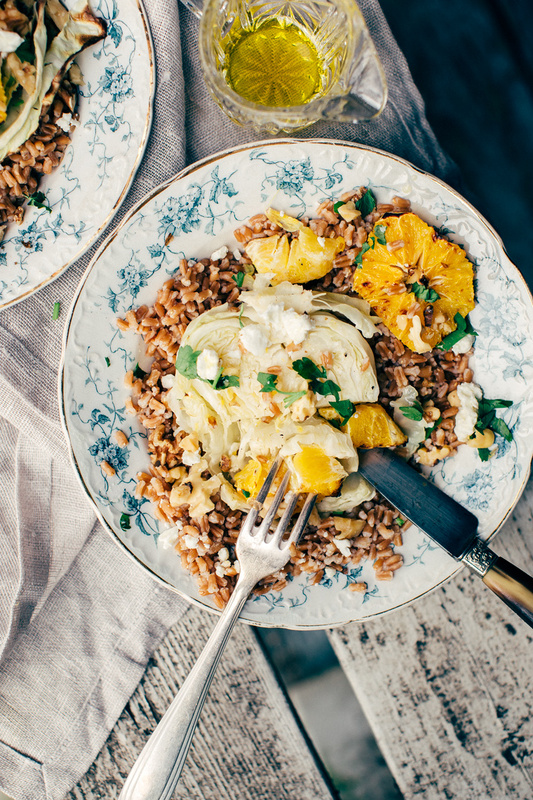 These wonderful wintery ingredients are placed on a bed of farro – high in fiber and a good source of iron and protein, it’s guaranteed to keep you going even on the coldest of days. First, pre-heat oven to 375F. Next, start by cooking the farro. Rinse and drain farro. Place in pot with 3 cups of water. Cover pot and bring to a boil. Reduce heat to medium-low and simmer for 30 minutes or until tender. Drain excess water and add some salt to taste, if you like. While the farro cooks prep the cabbage. Wash and slice the cabbage as shown so that you get about 4 to 5 even discs. Rub each disc with olive oil (about 1/2 teaspoon per disk) sprinkle with garlic powder, salt and pepper. 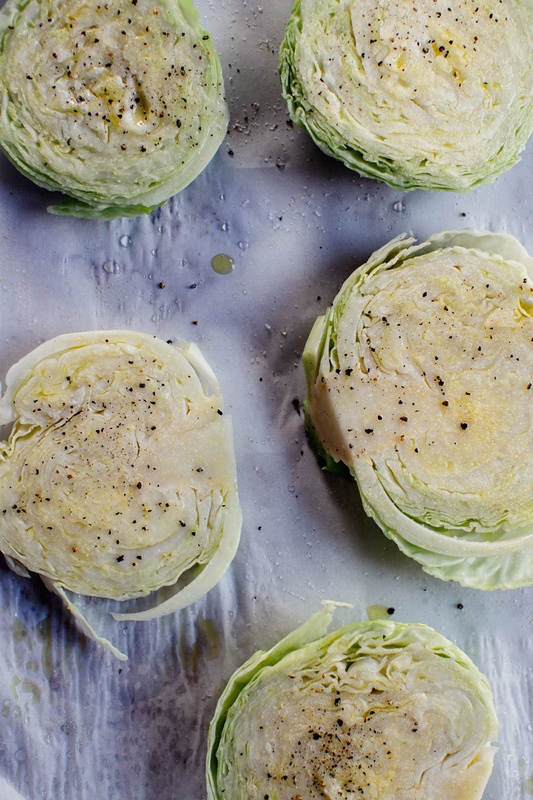 Place on baking sheet and bake for 15 to 20 minutes or until you can easily pierce the cabbage with a fork. 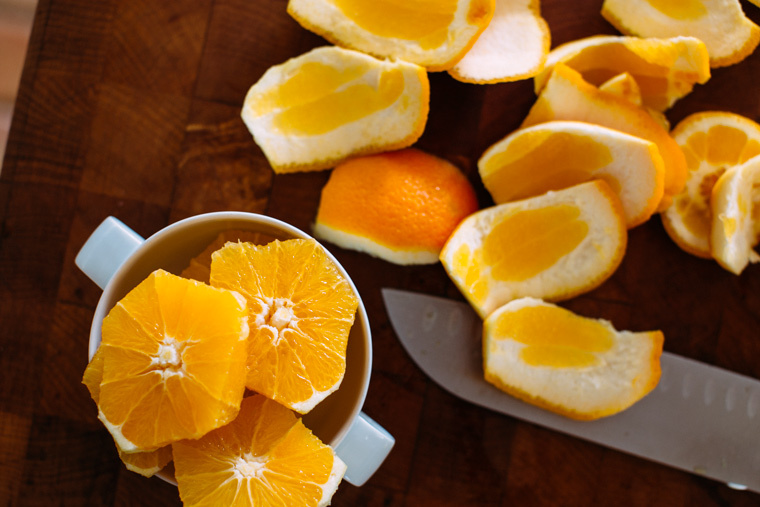 While the cabbage roasts cut oranges into small discs as shown. If the peel pieces have some juicy flesh left on them save them to squeeze on the final dish before serving. When the cabbage is finished roasting, remove from oven and broil oranges. Place the orange slices in an oven-proof dish or non-stick baking sheet and broil until just beginning to blister – about 5 minutes. 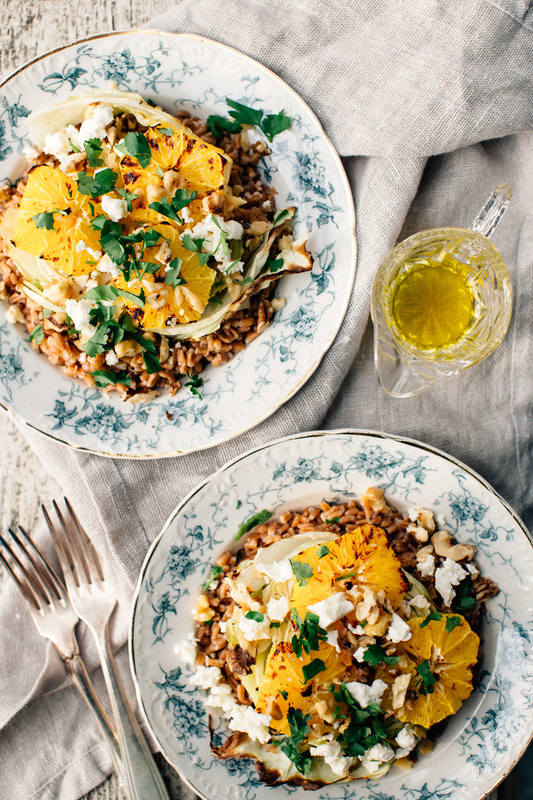 Assemble the bowls with farro, roasted cabbage and broiled oranges on top – sprinkle with crumbled feta, walnut pieces and fresh parsley. Drizzle the finished dish with a bit of good olive oil and squeeze of orange. I completely agree, cabbage doesn’t get enough attention. I have been roasting red cabbage lately and adding it to various bowls and it is seriously good! Your salad looks amazing, those broiled oranges!!! Yum! Very true, cabbage should get way more credit than it does. I love it in stews and shaved thin for massaged salads. But I need to roast it more, especially with those broiled oranges. 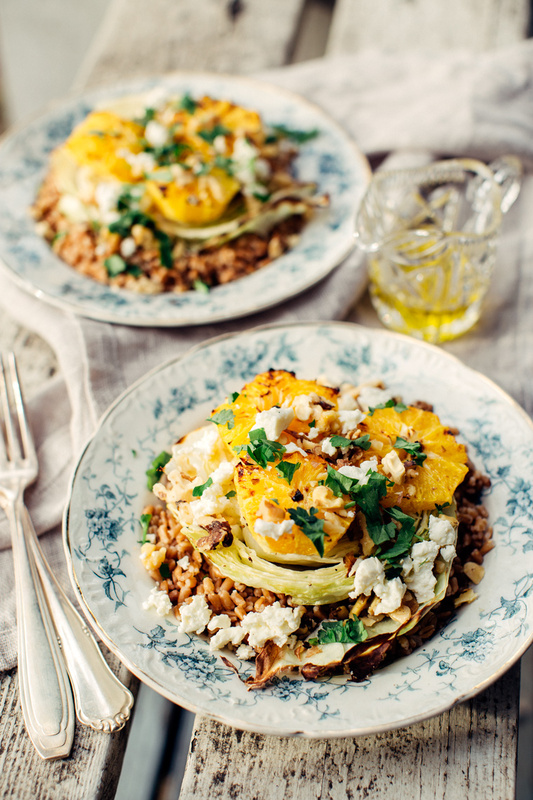 Love that you added feta and walnuts for contrast too. Your recipes are so creative, I would never have thought of mixing these ingredients, but it looks really good!